In this surfing holiday at the Boavista Island in Cape Verde, you will have all the time in the world for experiencing and enjoying all the good things in life. What makes this island a paradise is the lifestyle, the beaches close to nature, and especially the friendliness of the people. This holiday is ideal for those seeking an adventure for water sports and to those who want to relax and eat good food. You will be provided seven nights of accommodation at the Fado Crioula. Shaped by the sea, Fado Crioula could be a pirate shelter. A house on the beach with wide open windows and the sea-fresh breeze will be your best company. A superb view and picturesque décor, the house is divided into intimate ambience that challenge the most conservative minds. The house is divided between interior and exterior spaces, each with an atmosphere and perspective. There is a terrace with 360-degree views, direct access to the beach, bar, and dining area. It is the ideal setting for a nutritious and inspiring breakfast, a romantic lunch by the Atlantic breeze, or an afternoon of reading in one of the hammocks scattered throughout the Casa's space. If this is also the case, two rooms with private bathrooms are available for a longer walk in the best-kept place of Sal Rei. Navigating, flying with the wind, making incredible maneuvers with a kite, kitesurf or kiteboarding has become in a short time a trend of sport due to the ease in learning this sport in a short time. Boavista Windclub has classes for all levels. Whether you are a beginner taking the first steps in kitesurfing, or if you want to improve or do advanced level maneuvers. Boavista Windclub has the instruction that you need. They also have the latest F-One equipment for lessons or rentals, or if you have your own equipment, you can store it at the center. You will receive safety rules and surf spot information through the experienced staff. The classes are given in small groups with learning material for adults and children, and all the centers are certified by IKO or VDWS, so you can choose the course indicated for your needs. Those who have never practiced sport will learn the basics of the modality you have chosen to be able to move to another level. You can refresh your skills if you have already practiced the sport but want to improve, or you can complete all the courses to learn all the steps until you are able to practice the sport. You will be guided step by step until you learn the maneuvers you want. The private lesson is the easiest way for you to learn. The instructor will be at your side all the time, thus allowing a quick correction of errors and an effective explanation of the maneuvers to be performed. The service photographer is always available to record the best moments of your surfing activity. He will accompany your session and make the photos or videos of your life so you can put them on social networking sites or you can show to your friends the magnificent moments of your holiday on Boavista Island. Storage is the much-sought after service for you to travel with your own equipment. The windsurf, kitesurf, or SUP equipment is not easy to transport to your apartment or hotel, and for this reason, you will have at your disposal a quality service for storage of material. The very professional staff will give you all the support, including surf spot guidance such as entry and exit locations, wind zones, safety rules, and unlimited departure and landing assistance of the kite. They will note your name and the time whenever you go into the water for your safety, and the watchman will always be present in the tower watching you. If you need rescue, he will contact one of the boats and the rescue will be carried out in the middle. After the session, clean the equipment by removing most of the sand to preserve it and keep our space clean using sea water because fresh water is a precious commodity on the island of Boavista, place the equipment in the place indicated to you accessories should only be placed in the cage after they dry and drive home relaxed without luggage. Services included are surveillance, rescue, and assistance for departure and landing of kitesurf equipment. The center is located in Boavista Island, Cape Verde, and it is without doubt one of the most beautiful and best conditions for water sports among the 13 Cape Verde islands, located about 500 to 600 kilometers across the North African coast of Dakar, at about 1,000 kilometers south of the Canary islands. It was the first to be built on Boavista Island by French François Guy in 1995. 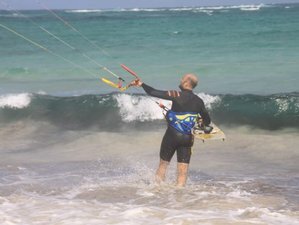 He was one of the first windsurfers to travel to Cape Verde and very soon found out in the country the excellent potential for water sports. The trade winds coming from the desert Sahara blows from November to late April, and it is one of the main attractions for windsurfers and kitesurfers. The perfect waves throughout the year make this destination a paradise for the practice of surf or SUP. During your stay in Boavista, do not miss the best spots to practice your favorite sport. The waves will be something unforgettable, and the guides are also experts who know the best surf spots for every day depending on the wind direction. The center is just a five to ten-minute walk from Sal Rei town, so you can move at ease, within access of the smallest hotels of the city. Daily breakfast and dinner are included. The menu is updated daily and you can enjoy the fresh and seasonal products. The natural juices of the day, fresh fish tartar, or Cape Verdean delicatessen are some of the options. Boavista has at your disposal a variety of activities so you can enjoy the excellent conditions that the island of Boavista has to offer. For the windy days, they can offer windsurfing, kite surfing, or sailing. You can go for surfing, stand up paddleboard, bodyboard, or skimboard. In calm days, it is suggested that you take a kayak ride or snorkeling with the experienced guides. Boavista Windclub is a water sports center, providing a range of quality equipment for all levels. Customer safety is one of their main objectives.